Will Orator of Ojutai draw triggered ability trigger when put from graveyard? When targeted abilities and redirects? 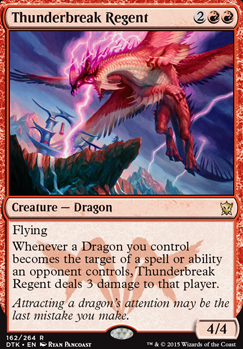 Whenever a dragon creature you control becomes the target of a spell or ability an opponent controls, Thunderbreak Regent deals 3 damage to that player. Hmm, interesting points. However, I actually see Patriarch's Bidding more like an enabler for Scourge of Valkas win with direct damage, which is my main objective, since everyone loses some life during game. 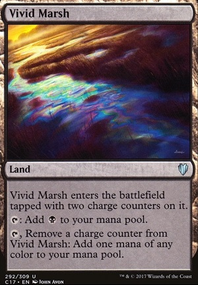 So when you have reanimation you dump Dragons to reanimate and some spells as a distraction but when you don't it's best to throw something you don't need like extra lands or ramp spells when you have 8+ lands already in play. 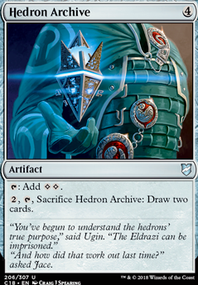 Sounds like a plan - let me know how the games went without Thunderbreak Regent since its the one that might get cut out. Also I didn't mention Brainstorm or Ponder since we were trying to focus on 3 main colors and not that much on splashes. 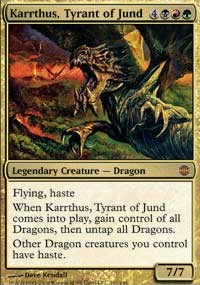 I think that this deck lacks some of the newest Dragons like Lathliss, Dragon Queen and Nesting Dragon . 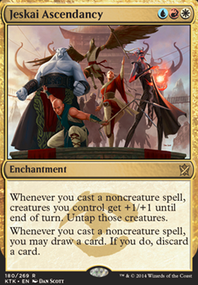 I'd also swap out some of them for more interaction like Glorybringer or static effects like Thunderbreak Regent . 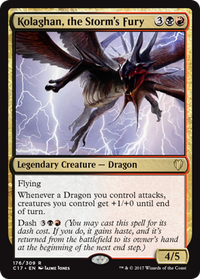 Another way to win is Commander with Atarka, World Render and Kolaghan, the Storm's Fury - this way even if only commander attacks it becomes 11/10 Double Striker, which is enough to one-shot someone with commander damage. Vlasiax on Gimme Those Dragons! Hello, to make this deck faster I'd cut like 2-3 lands Blackcleave Cliffs and one of Mountain and Swamp for Birds of Paradise , Deathrite Shaman and Nature's Lore . Vlasiax on Shiny MTG The Ur Dragon, LOTS OF FOILS! 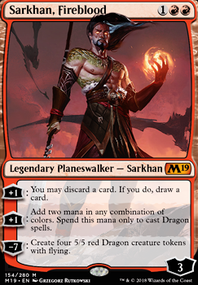 Hello, have you considered adding some low-curve Dragons like Nicol Bolas, the Ravager Flip, Glorybringer or Thunderbreak Regent ? I just feel that lowering the average CMC would feel amazing to play. Also since you have some token strategies how about Nesting Dragon and Dragon Broodmother ? They can really flood the board and Devouring Egg tokens actually upgrades them so you don't lose anything. SufferFromEDHD on I'm Zirilan, ... And These Are My Cousins! Hellkite Igniter and Hoarding Dragon are what stood out as weak dragons. Moonveil Dragon , Scourge of the Throne or Thunderbreak Regent fit a utility role currently missing from your Zirilan package. Akoum Hellkite and/or Valakut, the Molten Pinnacle seem appropriate for a mono red deck with 24 mountains. Is Molten Disaster not a better upgrade to Earthquake? Split second is a powerful ability.